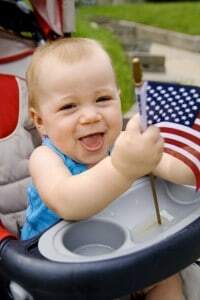 The Fourth of July celebration is one that all Americans love. Fireworks, friends, food and fun – no wonder we love it! Are you having this year’s party at your house? Here are some tips to help you stay on budget and still have a great barbeques. The most expensive part of any barbeques party is the food. The easiest way to deal with this expense is to have guests bring their own meat, and/or drinks. You could include this on the invitation – B.Y.O.B. (Bring Your Own Beef/Beer). This will not only cut down on costs, but it will allow everyone to enjoy the food that they most like to have on the grill. No more wondering if you should have a vegetarian option, or how many burgers or hot dogs to purchase; everyone will have what they like. If you have everyone bring their own meat and/or drinks, you will still need to provide side dishes. Here is where you will need your couponing skills. In the weeks prior to your event try matching coupons and sales to get the best prices on chips, condiments and pasta/potato salad ingredients. Don’t be tempted to purchase already made salads as they will be much more expensive than anything you can make by hand. In addition to food and drinks, you need paper plates, utensils, cups, etc. The best place to find these at a budget-friendly price is at your local dollar store. However, I would recommend purchasing more expensive plastic plates so that you can avoid any mishaps with overloaded plates. Another great location for paper good deals is the clearance section of a party store; however, this requires some advance planning. Stop by party stores after major holidays to stock up on discounted plates, cups and napkins. Also keep in mind that solid color items may be used for multiple occasions. For example, red napkins may be used not only for the Fourth of July, but also for Valentine’s Day, Christmas, Memorial Day and Labor day celebrations. Decorations from party stores can be really pricey. If you haven’t been stocking up all year (as mentioned above with paper goods), the cheapest way to decorate your party is with homemade decorations. If you have children, or if children will be attending, get them involved. They can paint flags on paper and cut stars out of construction paper. Snip holes in them and string them together for a festive decoration. Purchase plain white paper table cloths and have the kids draw on them. Fireworks, flags, stars and stripes are some easy and cute ideas. No kids at your party? try the ideas above yourself. Get a friend or two involved and make an afternoon of it. As you can see, the more in advance you plan, the more budget-friendly your Fourth of July celebration is going to be. Don’t be afraid to ask friends and family for help. They are usually thrilled that they don’t have to plan their own party and very willing to help you out! Stacey writes for Newlywed Survival. Read more about saving money and newlywed survival techniques on her blog dedicated to newly married couples. Great ideas! A pot luck is always a great idea! I love the idea of having people bring their own food. Potlucks save so much money! Great tips! I especially love having people bring a dish as I always worry about what allergies people may have as the boyfriend is allergic to tree nuts. We are planning a 4th of July party right now and these tips are so helpful! I love to have parties but hate to pay too much to have a great one!